Chole Bhature/ Fermented Indian Fried bread served with chickpeas curry / dry sauted masala. Its a delicacy no north Indian can ever say no to. This is a healthier version,so a good news for the weight watchers to relish their favorite Dish with way lesser calories as they are not fried but Baked. How many of you love chole bhature? 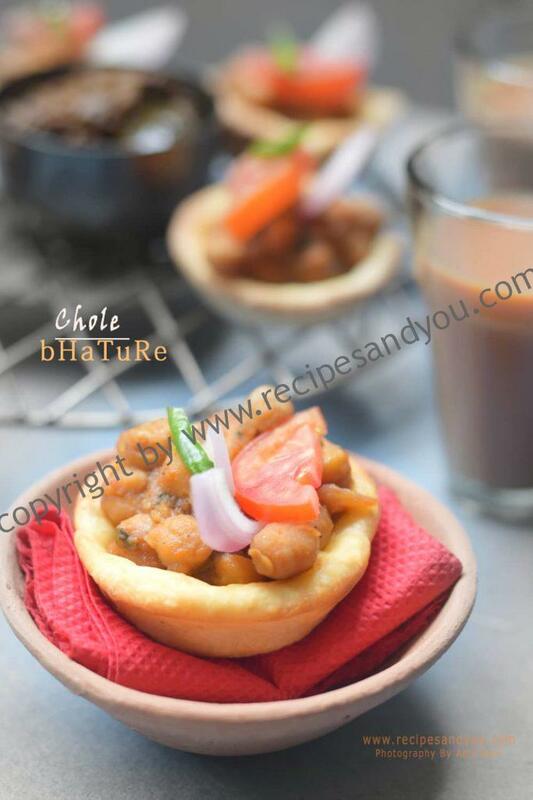 Presenting our very own chole bhature in a healthier Avatar!BAKED!! !With no compromise with the taste,these are just delicious.A crunchy bhatura base with masaledar/spicy chana .Served with aam ka achchar as topping. You’ll fall in love with it and might even replace the original with these.There are certain dishes ,which can bring your spirit and moods up anytime they are served. One such dish for me is Chole Bhature. A childhood favorite. I could hog on to these endlessly as a kid. But now you have to keep a close watch on the calorie meter and you do sometimes have to suppress your cravings and watch out for the health quotient too.Not anymore. Enjoy your meals /snacks with no worries. 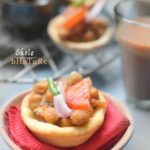 These low fat chole bhature bites are delicious and are a perfect healthy snack/meal. i will update a recipe for masala chana with home made chana masala also soon. 3 cups masala chana cooked dry . How to make Bahtura Flour: Take the all purpose flour in a blowl. Add clarified butter /Ghee and mix nicely with your fingers.The clarified butter should get well incorporated in the flour.the add sugar ,salt,soda bi carb and curd and mix again. Mix well till well incorporated. Now,knead a soft dough.Add water if needed to knead the flour.Add as much needed ,little by little to avoid dough getting too soft. Knead nicely for 3-4 minutes. Cover and keep away at a warm place,covered for about 2 hours. Assembling and Baking: After two hours. Pre- heat the oven at 200 degrees C for about 10 minutes .Meanwhile,make small balls of the dough to make mini roti's. Take a muffin tray and grease the indents. 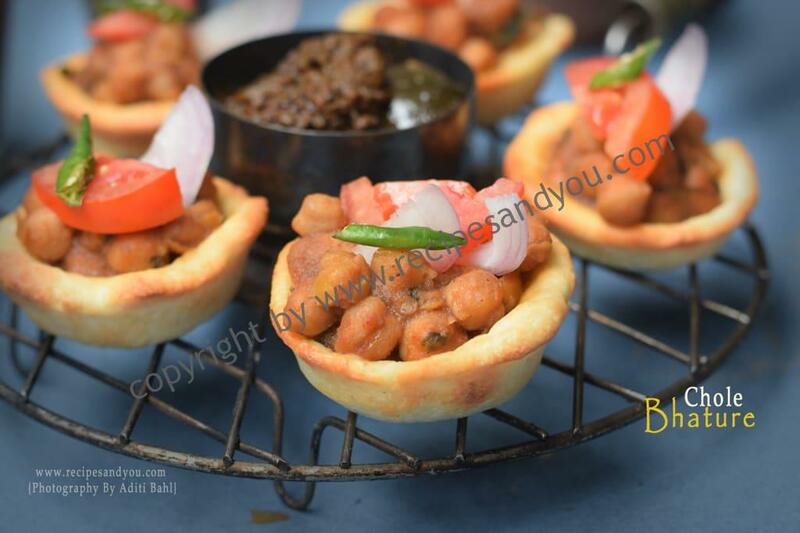 Once the crust is done.Take out the bhatura canapes and fill with the masala chana.Top it with a slice of onion and tomato and one drop of Aam ka achar and serve hot. Hi Aditi, i find this very interesting! Can you let me know if they will taste as good/ i hope the bhatura base wouldnt go too hard/ dry after baking? Hi pooja. Thanks for your interest. The base is a crispy outside and soft inside. It tastes really good.Youll not miss frying them atall. Hi. I really like this recipe and am planning on making it for a dinner at my place. Can the bhatures be made in advance? thanks shobhna. Yes in fact you can just like any base. You can blind bake them and keep them and rewarm for a few minutes when ready to serve.